In addition to scheduling our own events, PHDA is happy to pass on scheduling information about events that are related to our mission. Download the PDF flyer for the upcoming workshop! All workshops will be held at PHLF Housing Resource Center, 6:00 p.m., 744 Rebecca Ave, Wilkinsburg, PA 15221. To register, please call 412.242.2700 or email info@www.phdainc.org, or register online. 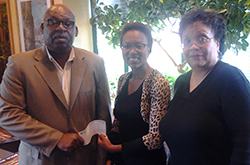 Ms. Taj Aura-Hood (center), with PHDA President Ernest Whitted (left) and Treasurer Marcy Morse (right).